I have worked with National Freezer for 8 years and have nothing but positive things to say about them. They have been our outside cold storage vendor for 8 years. During this time they have exceeded our expectations with their outstanding service. We partnered with National Freezer about 10 years ago for our frozen warehouse needs; since then our relationship has expanded to include dry storage and shuttle service to/from our manufacturing Plant. I unequivocally recommend National Freezer as they have proven to be consistently responsive, accommodating, accurate and professional. Receive high-quality cold storage services from our public refrigerated warehouse in Cleveland, Ohio. 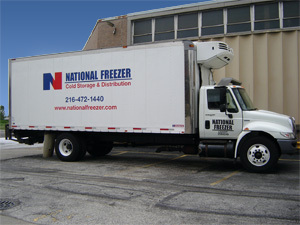 Since 2004, National Freezer has been providing the very best in services to customers across the Midwest. From logistics planning and dock management to the storage itself, you are sure to feel secure choosing our company for your cold storage needs. With more than 1.5 million cubic feet of cold storage, our team is capable of meeting all of your logistics and distribution needs. We have distribution channels that reach across the country and can help guide your products safely and securely to their final destination. Do not settle for anything less than the best when it comes to transporting your refrigerated items. We are members of the International Association of Refrigerated Warehouses (IARW) and World Food Logistics Organization (WFLO) dedicated to providing superior service and reducing our clients inventory costs. Copyright © National Freezer All rights reserved.